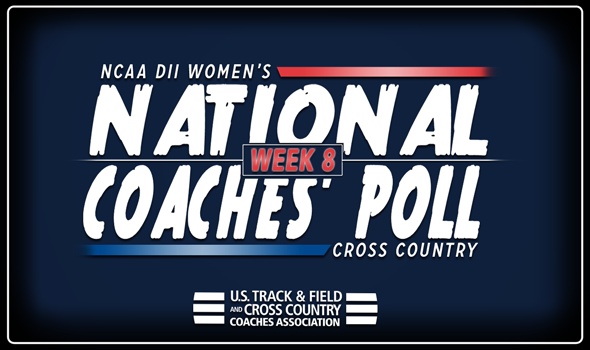 NEW ORLEANS – Regional Weekend brought big changes to the latest edition of the NCAA Division II Women’s Cross Country National Coaches’ Poll released by the U.S. Track & Field and Cross Country Coaches Association (USTFCCCA) on Wednesday. While the top-four programs in the country might have remained the same from the previous poll, the remaining 21 teams all experienced some kind of movement in preparation for the NCAA Division II Cross Country Championships on December 1 in Pittsburgh, Pennsylvania. The No. 1 spot in the nation once again belonged to Adams State after the program received all eight first-place votes. The Grizzlies have stayed atop the country in all nine polls this year. The last program to accomplish a season-long streak was Grand Valley State in 2014 which ended with the Lakers winning the national championship. Adams State will enter NCAAs as the favorite. The Grizzlies are coming off a win at a tightly-contested South Central Regionals in which they outkicked Western Colorado, the next time on this list, to a 30-31 point total. The group had three top-five finishers in Eilish Flanagan (third place), Roisin Flanagan (fourth) and Stephanie Cotter (fifth). All five scored athletes finished in the top-11.Also experiencing no change was Western Colorado after a runner up finish at the South Central Regionals. The Mountaineers lost by just a single point to the top team in DII and had the individual champion in Alicja Konieczek. Its five scored athletes all came in the top-14 in what was a great battle to the end. Western Colorado is after its program’s fourth NCAA title and first since 2002. Staying put at No. 3 was Grand Valley State after the Lakers won their 18th consecutive Midwest Regional championship. The group landed six athletes in the top-15 to total 26 points which included individual champion Sarah Berger who became the third female athlete to win the regional crown in program history. The Lakers are looking for their sixth NCAA Championship and second in the past three years. Holding pat at No. 4 was U-Mary after its third straight Central Regional title. The Marauders were paced by a 1-2 finish by individual champion Jaiden Schuette and Emily Roberts and placed five runners in the top-14 for 29 points overall. U-Mary has yet to win a NCAA Championship in program history. Improving two spots to move into the top-five for the first time this year was No. 5 Alaska Anchorage after a victory at the West Regional Championships. The group won the team title with a score of 66 points and were led by individual champion Emmah Chelimo. The Thunderwolves are trying to claim their first national title. Also jumping up two was No. 6 Augustana (S.D.) after punching its ticket to NCAAs with a second-place finish in the Central Regionals. The Vikings were led by Mackenzie Kelly in third overall. The program is making its 12th trip to nationals in the past 16 seasons and is still after its second title and first since 2011. Dropping one spot was No. 7 Colorado Mines after the program finished third to qualify for nationals at the South Central Regionals. The Orediggers top-finisher was Zoe Baker at 13th overall as they placed their five scored athletes in the top-26 of the meet for 105 points. Advancing two spots was No. 8 Simon Fraser after a second-place performance at the West Regionals. The squad was paced by Olivia Willett in fourth and had its top-three athletes finish in the top-13. The ranking ties the best mark received by the Clan this season. Dropping four from its previous position but still remaining in the top-10 was No. 9 Chico State after a third-place finish at West Regionals. The Wildcats posted 88 points and trailed second-place Simon Fraser by just three. Six Chico State athletes finished in the top-23 at the meet which includes top-finisher Alexandria Tucker who came in 14th overall. Moving into the top-10 with a one-spot improvement was No. 10 Pittsburg State who is back into the mix of the ten best teams since the preseason poll. The Gorillas took third to earn an automatic bid to NCAAs at the Central Regionals and were led by Piper Misse in 19th. Pitt State actually tied for third at the meet with Oklahoma Baptist but won the tiebreaker. Both Pitt State and Oklahoma Baptist (just below) are heading to nationals. Colorado Mines, Simon Fraser, Chico State and Pittsburg State have not won NCAA titles in its respective program’s history. The largest gain in the poll belonged to No. 12 UC-Colorado Springs who shot up 13 spots after fourth-place showing in the stacked South Central Region. Other big improvements went to No. 14 Western Washington (up seven spots) and No. 11 Oklahoma Baptist (up four). There were only two new programs that joined the poll this week in No. 17 Metro State and No. 18 Hillsdale. It is the first time since 2014 that Metro State has entered the top-25. Both teams will race at nationals. Saginaw Valley State, Embry-Riddle (Fla.), Stonehill, Cal State San Marcos, Union (Tenn.), Roberts Wesleyan and Lee (Tenn.) also recieved votes.